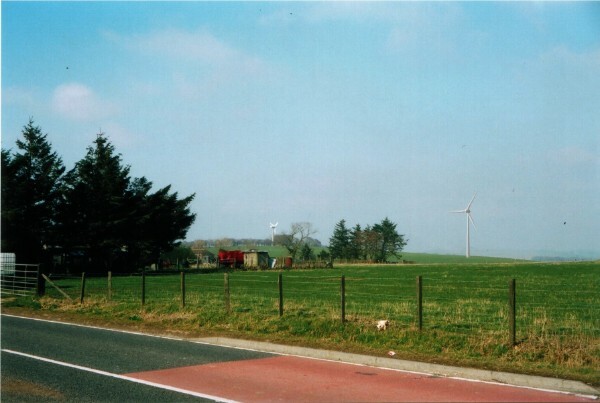 Mains of Bogfechel in Aberdeenshire was one of the first farms in Scotland to use wind turbines as a way of reducing the cost of electricity, with a small Polenko turbine installed during the 1980s. This turbine is no longer functioning, and accordingly the landowners decided that a new turbine for the farm was required. A renewable energy project was considered ideal for developing the viability of the farm by providing sustainable economic diversification, and assessment of the area indicated that this site would be appropriate for a single wind turbine. Orkney Sustainable Energy Ltd were retained to provide advice to the farm, and have become responsible for design, planning and operations. Planning consent for an Enercon E48 900kW wind turbine was awarded in 2009, with construction and commissioning completed in March 2011; the turbine is fully operational and working exceptionally well. This image shows the location of the Enercon E48 turbine when viewed from Whiterashes; the small Polenko turbine has now been removed.